DON'T MISS A MOMENT OF THE ACTION!!! Watch Live Action via Live Barn! All games played at United Civic Center are Live & On Demand. LiveBarn allows Friends & Family to follow along with the action from their mobile device, tablet or computer either Live or at a more convenient time. Games are broadcast both live and via on-demand replay. Athletes and coaches have the benefit of reviewing their games and sharing video highlights online or downloading full games for archival purposes. When you subscribe to LiveBarn, you can stream unlimited video from any LiveBarn venue for $14.95 or $24.95/ month. Use our UNITED CIVIC CENTER PROMO CODE: 53a9-edea for a 10% discount on your subscription! For more information or to sign up, visit www.livebarn.com. 2. 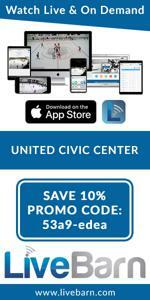 Search for your rink by using "United Civic Center"